St. Antoninus, or Little Antony, was born at Florence in 1389. His parents, named Nicholas Pierozzi and Thomassina, were noble citizens of that place, and he was the only fruit of their marriage. From the cradle he was modest, bashful, docile, and had no inclination but to piety, being even then an enemy both to sloth and to the amusements of children. It was his only pleasure to read the lives of saints and other good books, to converse with pious persons, or employ himself in prayer, to which he was much given from his infancy. Accordingly, if he was not at home or at school, he was always to be found at St. Michael's church before a crucifix, or in our Lady's chapel there. And whether he applied himself to that holy exercise in his closet or the church, he always kneeled or lay prostrate, with a perseverance that astonished everybody. By the means of a happy memory, a solid judgment, and quick penetration, assisted by an assiduous application, he became an able master at an age when others scarce begin to understand the first elements of the sciences. But his passion for learning was not equal to his ardor to perfect himself in the science of salvation. In prayer, he begged nothing of God but his grace to avoid sin, and to do his holy will in all things. F. Dominic, a learned and holy preacher of the order of St. Dominic, afterwards made cardinal, archbishop of Ragusa, and legate of the holy see, was then employed in building a convent at Fiesoli, two miles from Florence. Antoninus was wonderfully delighted with the unction of his sermons, and never went out of Florence but to converse with that apostolic man, to whom he applied at last for the Dominican habit. The father judging him as yet too young, and his constitution too tender for so strict a life of perpetual abstinence, frequent fasts, long watchings, and other rigors, advised him to wait yet some years, and bid him first study the canon law, adding, that when he should have learned Gratian's decree by heart, his request should be granted. So dry and difficult a task would have seemed to another equivalent to an absolute refusal. However, Antoninus set about it, and joining prayer and severe mortifications with his studies, made an essay of the ]life to which he aspired; and in less than a year presented himself again to the prior of Fiesoli; and by answering his examination upon the whole decree of Gratian, gave him a surprising proof of his capacity, memory, and fervor. The prior hesitated no longer, but gave him the habit, he being then sixteen years of age. The young novice was most exact in complying with every point of the rule, and appeared the most humble, the most obedient, most mortified, and most recollected of his brethren. Being advanced to the priesthood, he augmented his exercise of piety; he was never seen at the altar but bathed in tears. Whether sick or well, he day always on the hard boards; and so perfectly had he subjected the flesh to the spirit, that he seemed to feel no reluctance from his senses in the service of God. 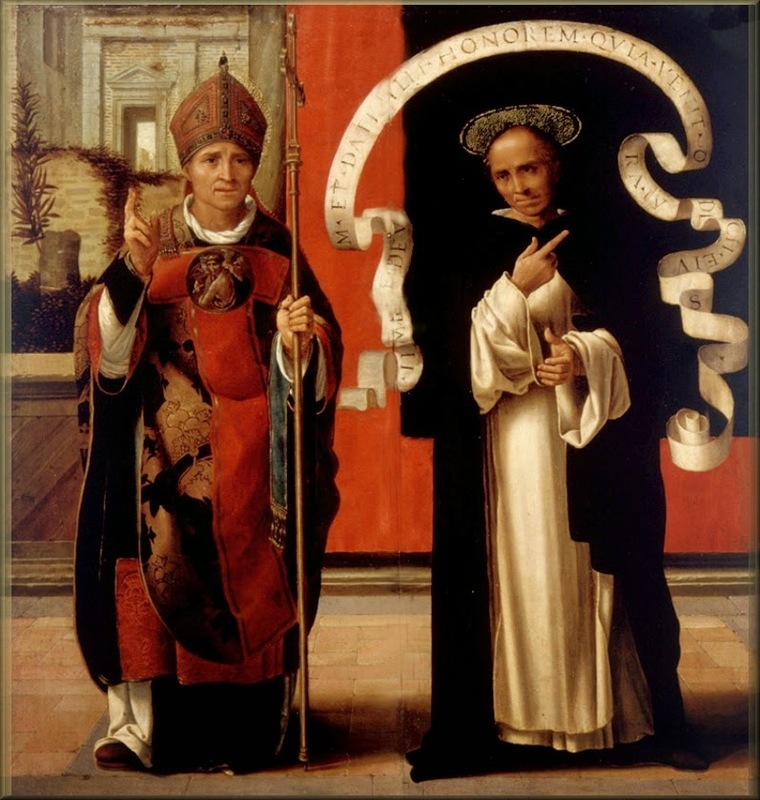 He was chosen very young to govern the great convent of the Minerva in Rome, and after that, was successively prior at Naples, Cajeta, Cortona, Sienna, Fiesoli, and Florence: in all which places he zealously enforced the practice of the rule of St. Dominic, and more by his actions than words. Besides his domestic employments he preached often, and with great fruit. The works which he published increased his reputation. He was consulted from Rome, and from all quarters, especially in intricate cases of the canon law. The learned cardinal de Lucca reckons him among the most distinguished auditors or judges of the Rota, though we do not find at what time he discharged that office. He was chosen vicar or general superior of a numerous reformed congregation in his order. He would not remit any thing in his austerities or labors when exhausted by a decay, of which however he recovered. Pope Eugenius IV called him to the general council of Florence; and he assisted in quality of divine at all its sessions, and at the disputations with the Greeks. During his stay at Florence he was made prior of the convent of St. Mark in that city, for which Cosmus of Medicis, called the father of his country, was then building a sumptuous church, which pope Eugenius IV. consecrated. After having established in this house the true spirit of his order, he visited his convents in Tuscany and Naples. While employed in introducing the primitive discipline of his order in the province of Naples, the see of Florence became vacant by the death of its archbishop. The intrigues of several candidates protracted the election of a successor. But pope Eugenius IV. no sooner named F. Antoninus to the Florentines, as possessed of the qualities they had desired in their future bishop, namely, sanctity, learning, and experience, and his being a native of their own city, than they all acquiesced in his choice. Antoninus, who had then been two years absent from Florence, employed in the visitation of his monasteries, was equally surprised and afflicted that he should have been thought of for so eminent a dignity. And that he might escape it, he set out with the design of concealing himself in the isle of Sardinia; but being prevented in the execution, he was obliged to go to Sienna, whence he wrote to the pope, conjuring his holiness not to lay that formidable burden on his weak shoulders, alleging his being in the decline of life, worn out with fatigues and sickness; enlarging also upon his great unworthiness and want of capacity; and begging that he would not now treat him as an enemy whom he had honored with so many marks of friendship. He could not close his letter without watering it with his tears. The pope, however, was inflexible, and sent him an order to repair without delay to his convent at Fiesoli. He wrote at the same time to the city of Florence, to acquaint, them that he had sent them an archbishop to their gates. The principal, persons of the clergy and nobility, with Cosmus of Medicis at their head, went out to compliment him on that occasion; but found him so averse to the dignity, that all their entreaties to take it upon him were to no purpose, till the pope, being again applied to in the affair, sent him an order to obey, backing it with a threat of excommunication if he persisted in opposing the will of God. After many tears, Antoninus at last complied; he was consecrated and took possession of his bishopric in March, 1446. His regulation of his household and conduct was a true imitation of the primitive apostolic bishops. His table, dress, and furniture showed a perfect spirit of poverty, modesty, and simplicity. It was his usual saying, that all the riches. Of a successor of the apostles ought to be his virtue. He practiced all the observances of his rule as far as compatible with his functions. His whole family consisted of six persons, to whom he assigned such salaries as might hinder them from seeking accidental perquisites, which are usually iniquitous or dangerous. He at first appointed two grand vicars, but afterwards, to avoid all occasions of variance, kept only one; and remembering that a bishop is bound to personal service, did almost every thing himself, but always with mature advice. As to his temporalities, he relied entirely on a man of probity and capacity, to reserve himself totally for his spiritual functions. He gave audience every day to all that addressed themselves to him, but particularly declared himself the father and protector of the poor. His purse and his granaries were in a manner totally theirs; when these were exhausted, he gave them often part of his scanty furniture and clothes. He never was possessed of any plate, or any other precious moveables, and never kept either dogs or horses; one only mule served all the necessities of his family, and this he often sold for the relief of some poor person; on which occasion, some wealthy citizen would buy it, to restore it again as a present to the charitable archbishop. He founded the college of St. Martin, to assist persons of reduced circumstances, and ashamed to make known their necessities, which establishment now provides for above six hundred families. His mildness appeared not only in his patience in bearing the insolence and importunities of the poor, but in his sweetness and benevolence towards his enemies. One named Ciardi, whom he had cited before him to answer certain criminal accusations, made an attempt on his life; and the saint narrowly escaped the thrust of his poniard, which pierced the back of his chair. Yet he freely forgave the assassin, and praying for his conversion, had the comfort to see him become a sincere penitent in the order of St. Francis. The saint wanted not courage whenever the honor of God required it. He suppressed games of hazard; reformed other abuses in all orders preached almost every Sunday and holiday, and visited his whole diocese every year, always on foot. His character for wisdom and integrity was such, that he was consulted from all parts, and by persons of the highest rank, both secular and ecclesiastical: and his decisions gave so general a satisfaction, that they acquired him the name of Antoninus the counsellor. Yet this multiplicity of business was no interruption of his attention to God. He allowed himself very little sleep. Over and above the church office, he recited daily the office of our Lady, and the seven penitential psalms; the office of the dead twice a week, and the whole psalter on every festival. In the midst of his exterior affairs he always preserved the same serenity of countenance, and the same peace of mind, and seemed always recollected in God. Francis Castillo, his secretary, once said to him, bishops were to be pitied if they were to be eternally besieged with hurry as he was. The saint made him this answer, which the author of his life wished to see written in letters of gold: "To enjoy interior peace, we must always reserve in our hearts amidst all affairs, as it were, a secret closet, where we are to keep retired within ourselves, and where no business of the world can ever enter." Pope Eugenius IV. falling sick, sent for Antoninus to Rome, made his confession to him, received the viaticum and extreme-unction from his hands, and expired in his arms on the 23d of February, 1447. Nicholas IV succeeded him. St. Antoninus having received his benediction, hastened to Florence, where a pestilence had begun to show itself, which raged the whole year following. The holy archbishop exposed himself first, and employed his clergy, both secular and regular, especially those of his own order, in assisting the infected; so that almost all the friars of St. Mark, St. Mary Novella, and Fiesoli were swept away by the contagion, and new recruits were sent from the province of Lombardy to inhabit those houses. The famine, as is usual, followed this first scourge. The holy archbishop stripped himself of almost every thing; and by the influence of his words and example, many rich persons were moved to do the like. He obtained from Rome, particularly from the pope, great succors for the relief of the distressed. Indeed, the pope never refused any thing that he requested; and ordered that no appeals should be received at Rome from any sentence passed by him. After the public calamity was over, the saint continued his liberalities to the poor; but being informed that two blind beggars had amassed, the one two hundred, and the other three hundred ducats, he tool; the money from them, and distributed it among the real objects of charity; charging himself, however, with the maintenance of those two for the rest of their lives. Humility made him conceal his heroic practices of penance and piety from others, and even from himself; for he saw nothing but imperfections even in what others admired in him, and never heard any thing tending to his own commendation without confusion and indignation. He formed many perfect imitators of his virtue. An accident discovered to him a hidden servant of God. A poor handicraftsman lived in obscurity, in the continual practice of penance, having no other object of his desires but heaven. He passed the Sundays and holidays in the churches, and distributed all he gained by his work, beyond his mean subsistence, among the poor, with the greatest privacy; and kept a poor leper, serving him and dressing his ulcers with his own hands, bearing the continual reproaches and complaints of the ungrateful beggar, not only with patience, but also with joy. The leper became the more morose and imperious, and carried complaints against his benefactor to the archbishop, who, discovering this hidden treasure of sanctity in the handicraftsman, secretly honored it, while he punished the insolence of the leper. Florence was shook by frequent earthquakes during three years, from 1453, and a large tract of land was laid desolate by a violent storm. The saint maintained, lodged, and set up again the most distressed, and rebuilt their houses. But he labored most assiduously to render these public calamities instrumental to the reformation of his people's manners. Cosmus of Medicis used to say, that he did not question but the preservation of their republic, under its great dangers, was owing chiefly to the merits and prayers of its holy archbishop. Pope Pius II. has left us, in the second book of his Commentaries, a most edifying history of the eminent virtues of our saint, and the strongest testimonies of his sanctity. The love of his flock made him decline a secular embassy to the emperor Frederic ill. God called him to the reward of his labors on the 2d of May, 1459, in the seventieth year of his age, the thirteenth of his archiepiscopal dignity. He repeated on his death-bed these words, which he had often in his mouth during health, "To serve God is to reign." Pope Pius II. being then at Florence, assisted at his funeral. His hair-shirt and other relics were the instruments of many miracles. He was buried, according to his desire, in the church of St. Mark, among his religious brethren, and was canonized by Adrian VI. in 1523. His body was found entire in 1559, and translated with the greatest pomp and solemnity, into a chapel prepared to receive it in the same church of St. Mark, richly adorned by the two brothers Salviati, whose family looks upon it as their greatest honor that this illustrious saint belonged to it. Nor is it easy to imagine any thing that could surpass the rich embellishments of this chapel, particularly the shrine; nor the pomp and magnificence of the procession and translation, at which a area number of cardinals, bishops, and princes from several parts assisted, who all admired to see the body perfectly free from corruption, one hundred and thirty years after it had been buried.